My version of the answer to life, the universe and everything! So you have decided to move to a new state and you are thinking of bringing your vehicle along. Before you decide to go down that road, do read this post. This is a first-hand experience of the paper-work that this exercise entails and should give you a good idea of the process that follows. I moved to Bangalore from Mumbai in 2015. Around 3 years down the line, I decided to bring my Swift to Bangalore as well. Before I took the decision of bringing down my vehicle to the new state, I spent quite a lot of time reading up on the process of moving a vehicle from one state to another. And every article gave me a small piece of the entire picture but never the whole thing. In the end, I knew that this won't be something for the faint-hearted. But I decided to give a try any way. The following post will give you a good idea of all the steps involved in the entire process. Now when you move your vehicle from one state to another for a period of more than a year, you are supposed to pay the lifetime road tax again and re-register your car in the new state. And Karnataka is known to have one of the highest road tax rates in the country. If you are moving your vehicle for a period of less than one year, you do not have to pay road tax in the new state, but do keep a proof of the day when you entered the new state. Generally fuel receipts, vehicle service, toll receipts from the home state which mention the date and vehicle number can be shown as proof. But again it is up to the traffic police you encounter on a given day. Many people bring their vehicle to the new state and then realise that the road tax they are liable to pay again is a pretty huge amount, sometimes more than what the vehicle may be worth. Then they decide to take a chance with the traffic police. They are happy dodging the police, till one day they are caught and end up being penalised for the non-payment of road tax. If you have not applied for re-registration, you will be penalised as per the rule under Section 44 read with Section 177 of the Motor Vehicle Act, which states that failure to register the vehicle for more than 12 months, can lead to penalty of Rs 100 for the first offence and Rs 300 for the second and any subsequent offences. This is in addition to the tax that needs to have been paid from the vehicle’s time of entry, along with interest. So I prepared a nifty little Excel based tool that let's you know the exact amount of road tax you'll be liable to pay in Karnataka. 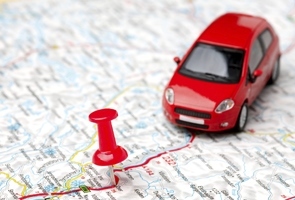 You can take an informed decision of whether to bring your vehicle to Karnataka or not. The invoice amount would be the one mentioned on your invoice which you received when taking delivery of your vehicle. This invoice would be required when you register the vehicle in your new state as well. This tool is specific to Karnataka and takes into various road tax slabs which again depend on type and age of the vehicle. The tax amount is correct as of September 2018 and if the rates change you'll have to update them by referring to the RTO website. You can find the tool at the post here. Before you can register your vehicle in a new state you would need to get an NOC from the RTO where the vehicle was originally registered. You can pay the road tax in the new state without an NOC (this is what I have read, not too sure). However to register your vehicle in the new state you would need the NOC. This NOC is usually addressed to the RTO under whose jurisdiction your new residential address falls. For Karnataka you can check the jurisdiction at the link below. 1) Once you get the NOC, you are supposed to pay the road tax and register your vehicle in the new state. 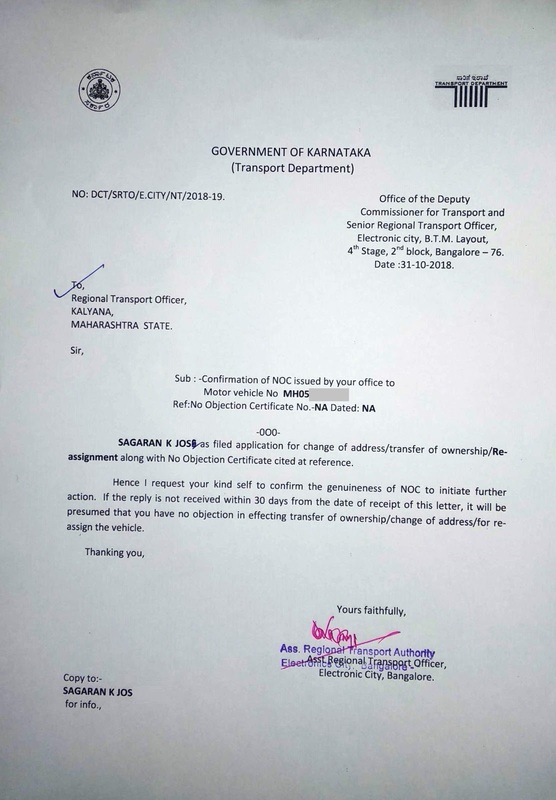 If you don't do this and want to return to your home state after some time, then you would need to get a non-utilisation certificate from the RTO to which the NOC was addressed, which basically says that the NOC wasn't used at the new state. The process for applying for the NOC is pretty straightforward. You'll require the following documents. NOTE : All the forms required for the entire process can be found at the link below. For the vehicle enquiry report, you will have to first get a letter from the original RTO (with stamp and sign) requesting for a vehicle enquiry addressed to the police Commissioner. You'll have to take this to the Commissioner's office in your home state and obtain the vehicle enquiry report from there. The report can be obtained from the link below. The purpose of this report is to show that there is no police case pending against this vehicle. However, some RTOs may not accept the report obtained online and would insist on you getting it from the Commissioner's office. The chassis number is a unique identifier for your vehicle and can be found embossed on certain specific areas on the vehicle's frame. The following image will show common areas where you can find the chassis number embossed. In the case of my Swift, I found it under the bonnet on the steering wheel side. 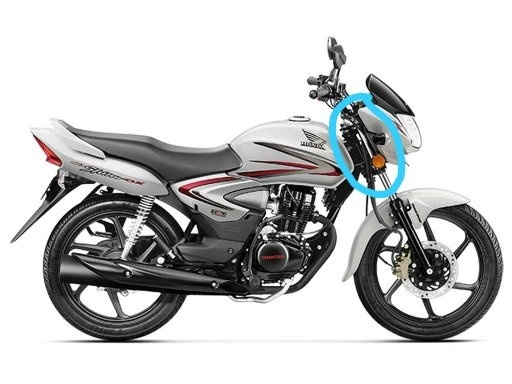 In the case of a bike, it is generally found near the neck portion where the handle meets the bike's body. 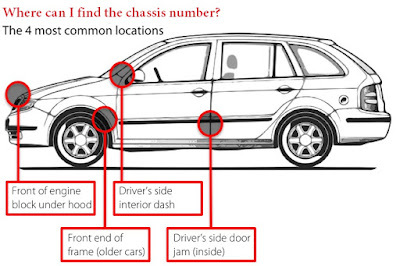 Check online or ask someone at the garage/RTO, if you cannot find the chassis number on your vehicle. You'll have to keep a piece of paper on the place where the chassis number is embossed and trace the area with a pencil to get a tracing of the chassis number. This tracing will need to be pasted on to the Form 28. This is what a pencil tracing of the chassis number would look like. You'll have to go to the RTO and submit all these documents and the RTO will issue a NOC usually immediately. The NOC will usually look like this. Do take photocopies of this NOC and a notarised copy of the original registration certificate, as this would be required for the refund process. So you have obtained the NOC from your original RTO and you have got your vehicle into the new state. The next step is to go to the RTO under whose jurisdiction your new address falls in. You can find under which RTO's jurisdiction your address lies at the link below. I found the Electronic City RTO to be one of the better RTOs I have ever been to. Rooms and counters are well-marked and easily identifiable. You would need the following documents before you go to the RTO and begin the process. Note : The forms with suffix KMV are specific to Karnataka. KMV stands for Karnataka Motor Vehicle Act. For other states, you can search for the corresponding form on the state's RTO website. iii) An affidavit mentioning your residential address. Go to the audit section in Room Number 6. A person will check your vehicle's invoice and calculate the payable road tax and scribble the amount on the form 14. I checked this amount with the amount calculated using my tool. And the amount was exactly same. Go to any bank and get a demand draft made for the specified amount. The RTO in the new state would also require a vehicle enquiry report from the new state's police department. you can get this report online from the link below. Go to the registration section (Room Number 5 at Electronic City RTO) and check if the RTO will accept this. If not, get a request form for SCRB report addressed to the Commissioner. 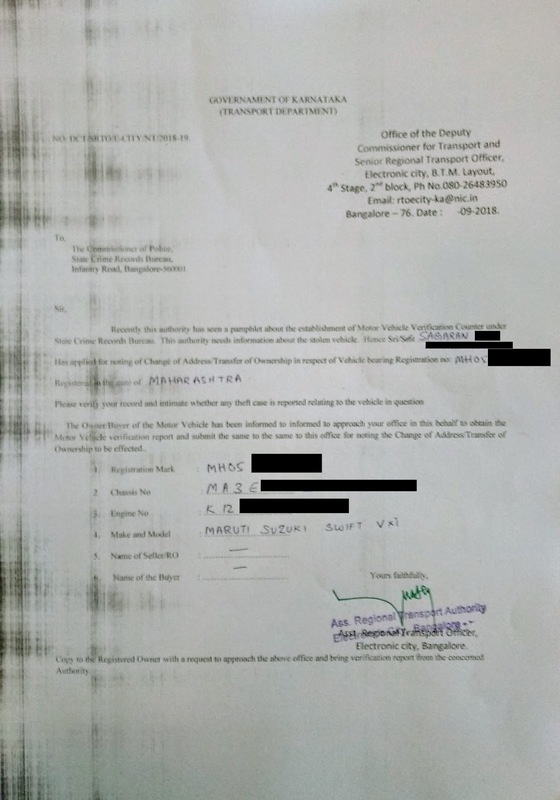 Get this request form signed by Assistant RTO (Non Transport) (Room Number 1). This is what the request form looks like. At the gate, mention that you need to get the vehicle enquiry report. You will be directed to the City Crime Record Bureau (CCRB) on the 4th floor. Go to the Motor Vehicle Enquiry Section. 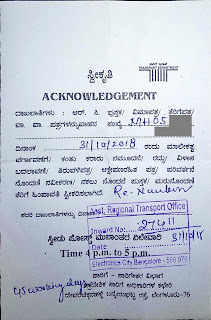 The person at the counter will check the request form you got from the RTO. Go to the Bangalore One counter near the entrance gate. Submit the filled request form, pay INR 25 and get the challan. Take the challan to the 4th floor and submit the application along with copies of NOC and ID proof. Wait for the report to be generated and handed over. In my case, it took about 15 minutes. The report will look something like this. Go to the registration section (Room Number 5 at Electronic City RTO) . Get the data entry done. Get the application checked and signed by Assistant RTO (Room Number 1). 4) INR75 at another counter for RC fees and collect challan for same. You'll get 2 copies of the receipts for payment of road tax and change of address charges. Get the application checked in the registration section (Room Number 5 at Electronic City RTO) . Ensure you have a folder for the forms and documents, a self-addressed envelop and a plastic pouch for the RC. The person at the counter might re-order the forms as required. Before you get the vehicle to the RTO for inspection, check when inspector would come for inspections. The inspector isn't available at the RTO throughout the day is what I understand. Attach a pencil tracing of the chassis number on form 27 KMV. Also, ensure that the vehicle is road worthy. I had to get my number plate changed because it didn't confirm to the prescribed size. Get the vehicle inspected by Vehicle Inspector in the basement. After inspection, inspector will sign the back of form 27 KMV. You would then require a stamp on it mentioning vehicle details. You'll get this in the basement. The Vehicle Inspector generally sits in Room Number 9 on the first floor or the basement. Finding the inspector was the most challenging part of the exercise, since half the time he wasn't around. The inspector would check the chassis number and verify it matches the one on the form. The back of form 27 KMV would look like this once the inspection is successfully completed. Submit application in registration section (Room Number 5 at Electronic City RTO) and collect the acknowledgement. You can drive around and show this acknowledgement and road tax receipt, in case anybody asks you for your Registration Certificate. The new RC smart card would reach you in about 45 days. NOTE : This RC smart card would have the old registration number but would be issued by the Karnataka RTO. This entire process can be completed in 1 day, if you plan it out properly and if luck is on your side. In my case, I had to make 3 visits. 1) 15 SEP 2018 (SATURDAY) - First visit to calculate road tax payable and collect SCRB request letter. 2) 18 SEP 2018 (TUESDAY) - Second visit to pay the road tax. 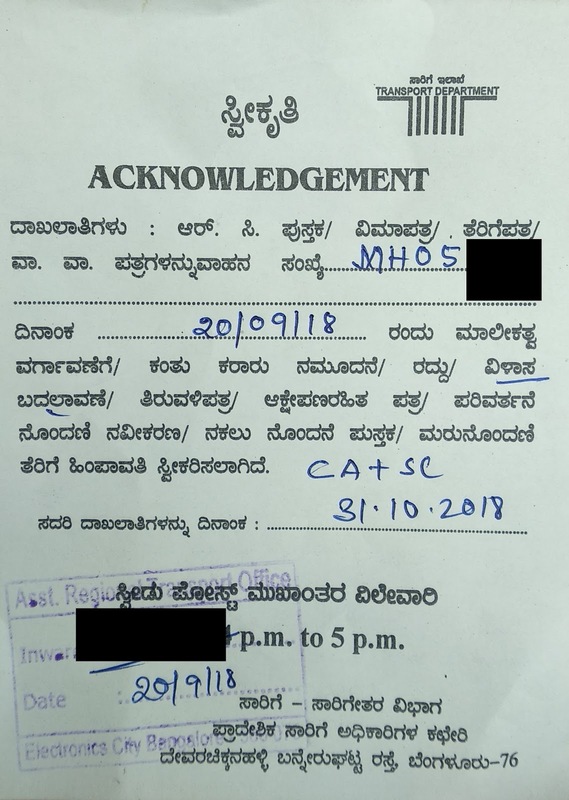 3) 20 SEP 2018 (THURSDAY) - Third visit to get vehicle inspected and submit the application. The process has been great so far. Now on to the next step. PS: As soon as you get this RC issued by the new RTO but having the old registration number, you can apply for the refund at the old RTO. More on that in the section on refunds below. The next step is to obtain a new registration number issued by the new RTO. In my case, it would be a KA51 number. 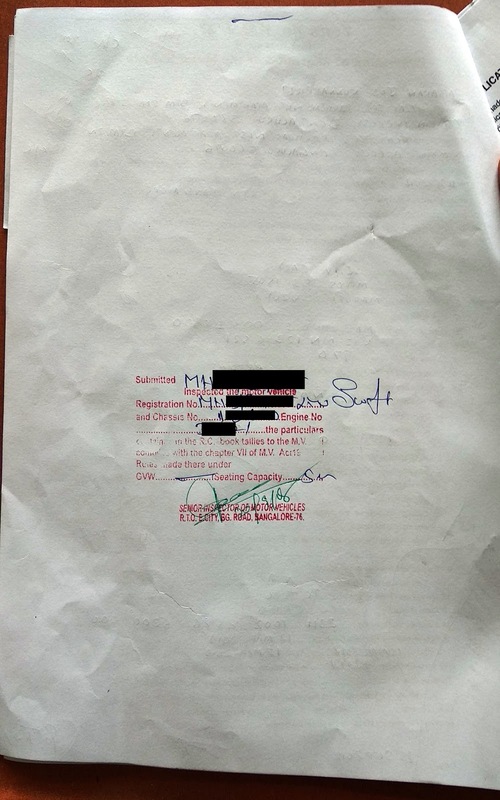 2) The concerned official will inspect the documents and will write down the amount to be paid on the form. 3) Go to the cash counter and pay the fees. In my case, it was INR 812 (Re-Assignment of registration mark INR600 + Smart Card Fees INR212 ). The fees of INR75 is paid at another counter. 5) Take it back to the Registration section and submit it. 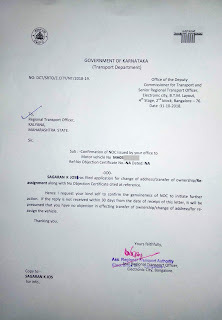 6)The next item in the process is for the new RTO to get a confirmation of the authenticity of the NOC from the old RTO. 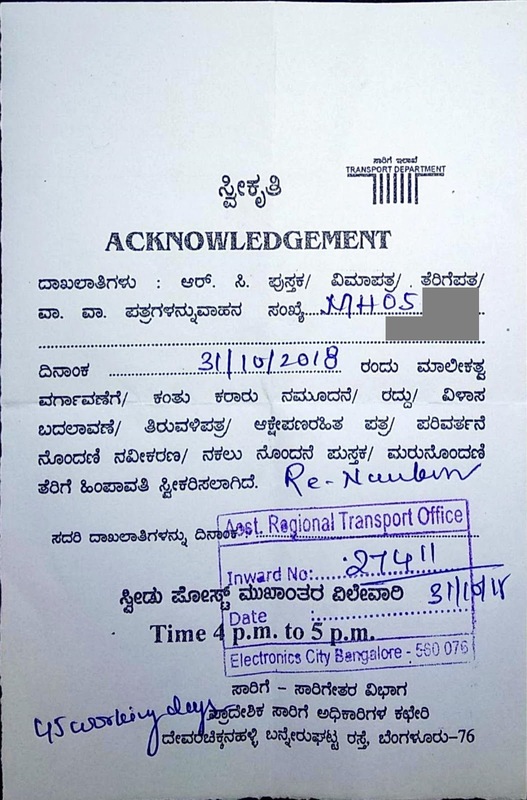 A letter is sent by the new RTO to the old RTO asking for the same, addressed to the old RTO. 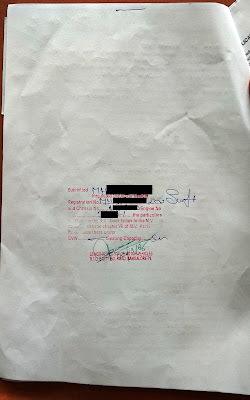 The confirmation by the old RTO has to be written on the same letter along with a stamp and sent back to the new RTO. If the confirmation is not received in 30 days, the old RTO is supposed to consider the NOC valid and proceed with the re-registration. As an alternative, the official at the registration section would give you a letter addressed to the original RTO and ask you to get the required confirmation from the old RTO. Clicking on "Vehicle Status" (marked in red) would give you the required details. You will receive an acknowledgement of the application along with an ETA of 45 working days mentioned on it. UPDATE : I was supposed to receive the updated RC with the new Karnataka number by 15DEC2018 but I hadn't received it yet. On 20DEC2018, I visited the RTO and my RC was ready, but was yet to be posted. I collected the same from the counter and signed the register kept at the RTO. By evening, the vehicle details were reflecting both in the parivahan and DigiLocker. As soon as you get the updated RC with the old registration number but issued by the new RTO, you can apply for the refund. The RTO has told us to expect a call in some time regarding the refund. The cancelled cheque needs to be submitted, once that call comes through. I am still waiting for this call on 20DEC2018. Train tickets on your mobile - UTS is here!